When the Regan family of Regan Brothers Bakery fame (a one-time Minneapolis institution) built their summer getaway on Lake Minnetonka’s Crystal Bay in 1905, the Twin City Rapid Transit Company was just wrapping up work on a streetcar line that connected Minneapolis and Excelsior. The line enabled Minneapolis residents to travel from the city to the lake in a mere 45 minutes, where they could hop on a streetcar steam boat and take a cruise. At last, the lake was accessible to city residents. Accessibility was top-of-mind 110 years later for an Edina couple as they were kicking around the idea of buying a lake place. They yearned for the relaxation and family time that a lake getaway promised. But with two teenagers and busy schedules, they didn’t want to have to drive far to get away. And so for a number of years, they didn’t give the idea much more thought. One day, though, the wife stumbled onto a photo in a real estate section at the back of a magazine. There was a picture of the white clapboard two-story that the Regans had built. The house, which looks like it belongs in Nantucket, was being offered by The Landschute Group. Intrigued, she decided to drive out to see it, arriving at a worksite rather than a staged home, as Landschute wasn’t quite finished renovating it. Still, she liked what she saw. The house was full of architectural details including transom windows, horizontal-panel doors, wide baseboards, and crown molding that all hinted at its advanced age. Yet all were in pristine condition. The transformation from a compartmentalized floor plan, ’90s kitchen, and detached garage into a home for today’s lifestyles was already underway. The three-bedroom house was perfectly sized for their family of four. And—best of all—it was only 30 minutes from their home in Edina. The couple bought it not quite finished. Throughout, Landschute integrated old and new materials. Baseboards and coves, balusters and newel posts, ceiling paneling and flooring are all new. Transom windows over the bedroom doors and on either side of the fireplace are old, as are some of the interior doors. Some of those items were in the house, others added. As for the feel of the place—that’s no accident, as Monson and his wife and design partner Mary spend a lot of time on the eastern seaboard. They felt the neo-classical style of the house called for a more formal approach than one might find in a typical Minnesota lake home. “We embraced the formality, yet wanted [the owners] to live informally,” he says. Flesher added bold graphic elements such as the black railing on the staircase and black turned-wood sconces from Dunes and Dutchess in the foyer. Black canvas tape on the white wood blinds creates vertical striping. He selected rugs with bold geometric patterns such as the flat-woven black, white, and red rug in the entry from Swedish company Kasthall. 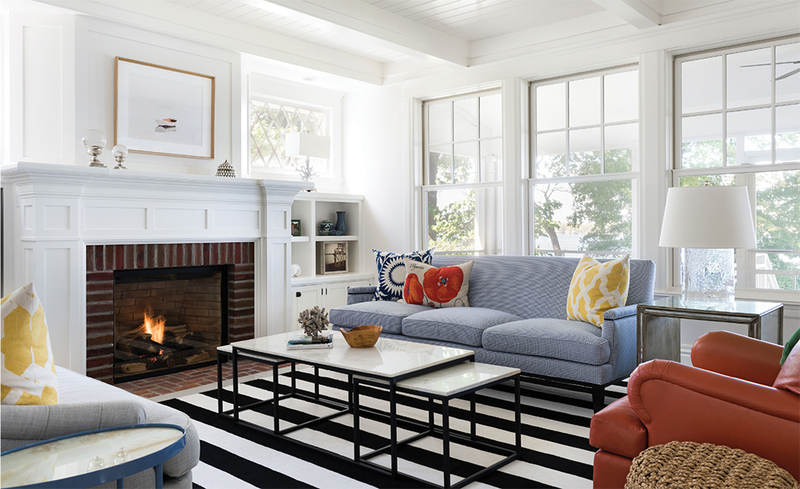 In the family room, mismatched gray and blue sofas flank the red-brick fireplace. Between them is a poppy-red leather armchair. 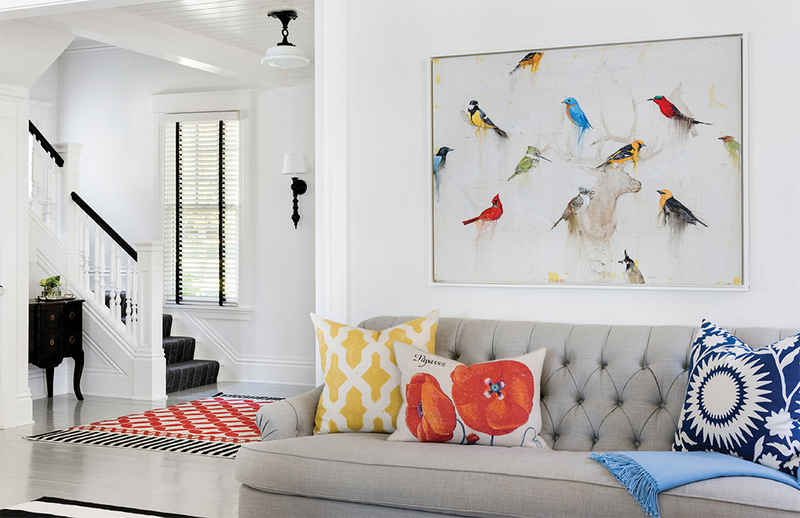 Pops of yellow, blue, and green appear in throw pillows and artwork. A sitting area just off the kitchen is composed of a sofa covered in black and white faux-bois fabric and topped with grass-green pillows, a Windsor occasional chair, and a Danish modern lounge chair. 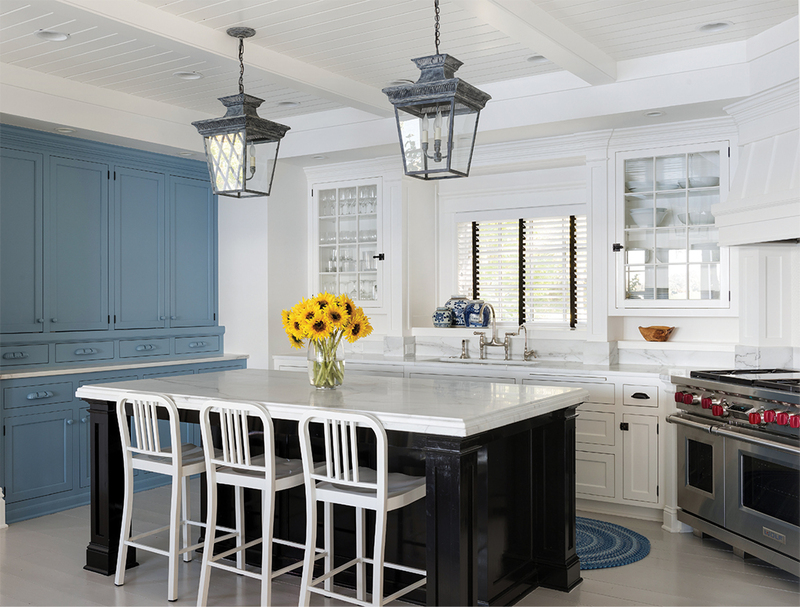 In the kitchen, Flesher took a European approach, aiming for cabinetry that looks like individual pieces of furniture. A hutch is painted an almost-French blue and has carved wooden pulls. The island is black and has brass pulls. Other cabinets are white with black pulls. “I always like to put different hardware on those pieces because it further emphasizes that feel that this is a different piece of furniture,” he explains. Bathrooms have fanciful wallpaper, reflecting Flesher’s belief that in small, enclosed spaces one can have a little fun. The black-and-white flowers and vines of the wallpaper in the master bath echo the black-and-white theme of the house. Flesher chose more subdued tones in the master bedroom, keeping the focus on the spectacular view. A sitting area is surrounded by windows. “When you’re sitting there, you feel like you’re in a cruise ship because all you see is the water,” he says. Somehow, old and new, black and white, color and neutral all work. The decorating feels playful, casual, and friendly while still respecting the many formal elements of the house. And thanks to the foresight of the original builder and recent renovator, nearly every room in the house offers stunning views of the lake. The house does what its owners wanted: “It makes us slow down,” the wife says. The porch spanning the structure is their favorite spot for doing that. On summer nights, it’s where you’ll find the couple doing what the Regans likely did a century ago—simply sitting and looking at the lake.